PH0000135/7 - PLYMOUTH CITYBUS LTD, MILEHOUSE, MILEHOUSE ROAD, PLYMOUTH, PL3 4AA Variation Accepted: Operating between PLYMOUTH Royal Parade and SOUTHWAY given service number 40/41 effective from 31-Aug-2014. To amend Timetable. PH0000135/8 - PLYMOUTH CITYBUS LTD, MILEHOUSE, MILEHOUSE ROAD, PLYMOUTH, PL3 4AA Variation Accepted: Operating between TAMERTON FOLIOT and ROYAL PARADE given service number 42/42A effective from 31-Aug-2014. To amend Timetable. PH0000135/9 - PLYMOUTH CITYBUS LTD, MILEHOUSE, MILEHOUSE ROAD, PLYMOUTH, PL3 4AA Variation Accepted: Operating between PLYMOUTH Royal Parade and PLYMOUTH Royal Parade given service number 43 effective from 31-Aug-2014. To amend Timetable. PH0000135/76 - PLYMOUTH CITYBUS LTD, MILEHOUSE, MILEHOUSE ROAD, PLYMOUTH, PL3 4AA Variation Accepted: Operating between ROYAL PARADE and DERRIFORD HOSPITAL given service number 29/29A effective from 31-Aug-2014. To amend Timetable. PH0000135/94 - PLYMOUTH CITYBUS LTD, MILEHOUSE, MILEHOUSE ROAD, PLYMOUTH, PL3 4AA Variation Accepted: Operating between Saltash, Oaklands Green and Eldburton, Blackstone Close given service number 5/5A effective from 31-Aug-2014. To amend Timetable. PH0000135/100 - PLYMOUTH CITYBUS LTD, MILEHOUSE, MILEHOUSE ROAD, PLYMOUTH, PL3 4AA Variation Accepted: Operating between St Budeaux, Square and St Budeaux, Square given service number 21/21A effective from 31-Aug-2014. To amend Timetable. PH0000135/149 - PLYMOUTH CITYBUS LTD, MILEHOUSE, MILEHOUSE ROAD, PLYMOUTH, PL3 4AA Variation Accepted: Operating between Plymouth Royal Parade and Travistock Bus Station given service number 12 effective from 31-Aug-2014. To amend Route and Timetable. PH0000135/154 - PLYMOUTH CITYBUS LTD, MILEHOUSE, MILEHOUSE ROAD, PLYMOUTH, PL3 4AA Variation Accepted: Operating between PLYMOUTH ROYAL PARADE and TAVISTOCK BUS STATION given service number 11/11A/11B effective from 31-Aug-2014. To amend Route and Timetable. PH0000135/155 - PLYMOUTH CITYBUS LTD, MILEHOUSE, MILEHOUSE ROAD, PLYMOUTH, PL3 4AA Variation Accepted: Operating between TAVISTOCK BUS STATION and WEST ST, OKEHAMPTON given service number 11 effective from 31-Aug-2014. To amend Route and Timetable. Clearly we needs to wait for the full detail but nothing really jumps out as unusual. PH0004983/35 - FIRST DEVON & CORNWALL LTD, THE RIDE, CHELSON MEADOW, PLYMOUTH, PL9 7JT Variation Accepted: Operating between TORPOINT FERRY and PLYMOUTH Bus Station given service number 81/81A effective from 07-Sep-2014. To amend Timetable. PH0004983/186 - FIRST DEVON & CORNWALL LTD, THE RIDE, CHELSON MEADOW, PLYMOUTH, PL9 7JT Variation Accepted: Operating between PLYMOUTH Bretonside Bus Station and LAUNCESTON Westgate Street given service number 76 effective from 07-Sep-2014. To amend Route and Timetable. 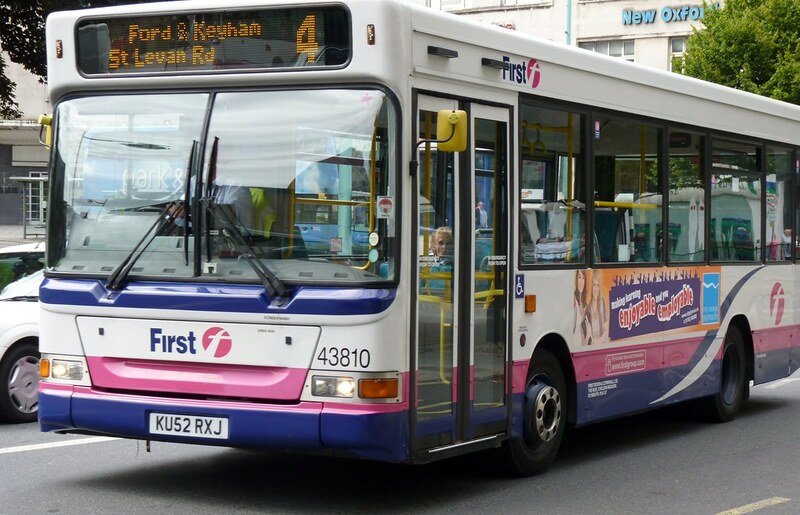 PH0004983/278 - FIRST DEVON & CORNWALL LTD, THE RIDE, CHELSON MEADOW, PLYMOUTH, PL9 7JT Variation Accepted: Operating between THE GEORGE PARK AND RIDE SITE and PLYMOUTH (Royal Parade) given service number PR1 effective from 07-Sep-2014. To amend Timetable. PH0004983/294 - FIRST DEVON & CORNWALL LTD, THE RIDE, CHELSON MEADOW, PLYMOUTH, PL9 7JT Variation Accepted: Operating between Coypool Park & Ride Site and Royal Parade given service number PR2 effective from 07-Sep-2014. To amend Timetable. PH0004983/328 - FIRST DEVON & CORNWALL LTD, THE RIDE, CHELSON MEADOW, PLYMOUTH, PL9 7JT Cancellation Accepted: Operating between Plymouth Royal Parade and Keyham given service number 4 effective from 07-Sep-2014. PH0004983/336 - FIRST DEVON & CORNWALL LTD, THE RIDE, CHELSON MEADOW, PLYMOUTH, PL9 7JT Variation Accepted: Operating between Plymouth Royal Parade and St Budeaux Square given service number 3 effective from 07-Sep-2014. To amend Route and Timetable. PH0004983/337 - FIRST DEVON & CORNWALL LTD, THE RIDE, CHELSON MEADOW, PLYMOUTH, PL9 7JT Variation Accepted: Operating between Plymouth Royal Parade and Mount Batten given service number 2 effective from 07-Sep-2014. To amend Timetable. PH0004983/335 - FIRST DEVON & CORNWALL LTD, THE RIDE, CHELSON MEADOW, PLYMOUTH, PL9 7JT Variation Accepted: Operating between Plymouth Royal Parade and Saltash given service number 1/1A effective from 07-Sep-2014. To amend Route and Timetable. PH0004983/389 - FIRST DEVON & CORNWALL LTD, THE RIDE, CHELSON MEADOW, PLYMOUTH, PL9 7JT Variation Accepted: Operating between Plymouth, Royal Parade and Kingsbridge Quay given service number 93 effective from 07-Sep-2014. To amend Timetable. At face value the cancellation of the 4 is a bit of a shock. It is in competition with Plymouth Citybus but I always thought that it used to be one of the better performing routes for First. I do wonder if there are more notices to follow as the 4 currently interworks with the 15 which so far is not mentioned this time around. It could be that the route change to the 3 is to cover at least part of the route? The other point of interest is the taking over of Western Greyhounds 579 (I assume we will be seeing that route cancelled shortly). ‘Scene’ in Hanley bus station, ‘Arriva' and 'Wardle Transport’. I was familiar with the old Hanley bus station and I had not yet seen the new one that opened in 2013 so a visit was long overdue. Although it was only a weekday, it seemed crowded and a driver told me to come back at tea time when it would be gridlocked.....! Executive pay row at FirstGroup heats up A row over executive pay at FirstGroup has stepped up a gear, as three influential investor advisory bodies flag concerns following an 86pc leap in the amount the transport company’s chief, Tim O’Toole, took home for the last financial year. Superficially Studying Shields Man & Shieldsman fbb has acquired most of the core information for this blog from Nexus, the transport authority for Newcastle and Sunderland. Typically he has done a bit of enhancement! Shieldsman Sails South via Solent to Shoreham The fbb's lodgement from last Thursday thru' Mionday was at Shoreham Beach, the now-built-on spit of shingle that forms the southern bank of the river Adur just before it joins the sea. Enterprise Coaches to operate Sunday 155 It seems Enterprise Coaches have won the contract for the East Riding of Yorkshire Council tendered Sunday service between South Cave, Gilberdyke, Howden and Goole. This is currently operated by EYMS. Fleet Update Just a few updates to report today, these being fleet updates from King's Lynn based Norfolk Green and operator of Norwich Megabus services Freestones Coaches. Out & about in Northumbria - part 3 For the first of today's posts we conclude our trip 'up north' to Northumbria to take a look at something a little bit different for our latest Out & about feature, this guest post which has been spread across three parts has been kindly provided by our regular correspondent Philip Slynn. Quantock in Taunton It's unusual for pretty much an entire rally to consist of one owner's vehicles, especially such a well-chosen selection of vehicles. A glance at the line-up above on the main site at Taunton's Castle Green will confirm that this really was a day for the classic bus (and coach!). As you said, we shall have to wand see. However, the 79 is shown as 'school days only', so it may well not be replacing the whole of the WG service. I had a quick look at the WG timetable and it shows school-time journeys for Liskeard - Callington School, Tavistick - Callington School and Callington - Tavistock School, so it is hard to see what a First service would achieve. The only serious overloading on the 574/5 I know about is from St. Cleer and Darite into Callington School and back - the Varios cannot cope with that and I have not seen the Dart again. Bit of a surprise re First 4 but they did cut back recently here leaving Citybus with more frequent service. Perhaps Number 3 can divert to cover part of Keyham ? Noticed as well 81 states start point Torpoint Ferry to Citycentre (Not HMS Raleigh) does this mean First are pulling out of Torpoint ( I seriously hope not!) or VOSA way of putting it . The interesting thing will be to see what First do with the spare capacity from the loss of the 4 etc, or if they do anything of course? Anyone got any knowledge re all these changes? Not sure we will be seeing Western Greyhound's 579 cancelled, as First's 79 registration is Monday to Friday schooldays. Time will tell. Didn't Firsts 1 & 2 use to do this? I have seen a WG Dart now on the Callington service which, despite having an electronic display, was just showing '576' in a label in the windscreen without showing any destination at all. Not much help to people who don't know service numbers but look for the final destination on the bus. At a quiz I was running a while back in Pensilva I put the question, "What is the service number of the bus through Pensilva?" and very few teams knew. They just get on the bus in Pensilva and, in Liskeard, look for the one with 'Callington' on the front. The fact that the service number was, at that point, 573, had changed to that from 574 and is now 574 or 575 makes looking for the destination sensible - especially as the new destination of Tavistock seems never to be shown. I don't know why the Dart on the 576 had a blank screen - when WG borrowed a Solo from Blackpool, they managed to programme the destination equipment to show what they wanted, albeit in orange rather than green. Incidentally, the replacement for DAC's 79 is not 579, it is 574/5 as it is now a through service from Tavistock to Liskeard - with a journey-time of up to just shy of two hours between towns not much over 20 miles apart. This may be the reason for First registering a schoolday 79 - because of the lengthy route, someone in Tavistock attending Callington School would have a direct WG bus in the morning, yaking half an hour, but would go home by the scenic route taking 55 minutes. I overheard a regular driver of the 12s outside Friary Mill yesterday say to another driver that every other 42 will be going to Tavistock. Not sure if there's any truth in this - merely what I overheard. Funny because on VOSA it says 42 to Tavistock. Cant see them doing 11,12 and 42 though. That would be overkill! At the Somerset end of the business there is expansion from 27 July. 21 doubled in freq to every 15 mins Taunton Hosp to Bridgwater section, 29 increased to hourly from every 90 mins Taunton to Wells, 54 doubled to every 30 mins Taunton to Somerton section plus new Sunday service hourly and all extended from Taunton bus station to Hospital. Hospital now gets 8 an hour instead of 4 and every 30 mins on Sunday all until 20:00. Has also got replacement vehicles for Park and Ride, but has meant all white vehicles turning up on service routes, which confuses prospective passengers as those are normally Webberbus vehicles. Interesting to watch Plymouth and Webberbus. I heard go-ahead want to do national express work out of Plymouth, can anyone confirm this? Citybus Tavistock service changes: my guess is that some services will be routed through Whitchurch. I spotted a Citybus person taking pictures of the junction near Whitchurch post office a few weeks back.